The Festival is now in full swing - see our what's on pages for all details and online booking. Crammed full of renditions of those famous comedy sketches, from Greig's Piano concerto to Mr Memory, "Arsenal! 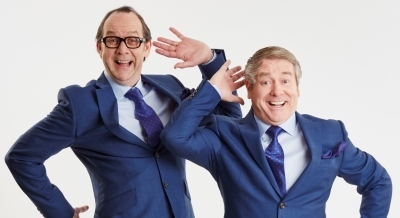 ", it's a show full of Morecambe and Wise's most loved routines, songs and sketches and of course a musical guest, evoking memories of times when whole families would huddle around the TV on Sunday evenings. We are delighted to announce another award win for Bath International Comedy Festival in partnership with Visit Bath - the Arts category of the 2019 Bath Life Awards! 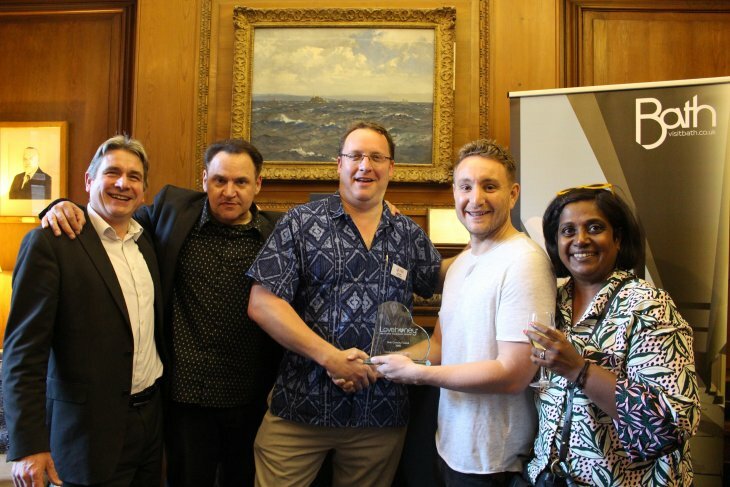 We are delighted to announce Bath International Comedy Festival in partnership with Visit Bath was awarded the Leisure & Tourism Award at this year's Bath Business Awards. 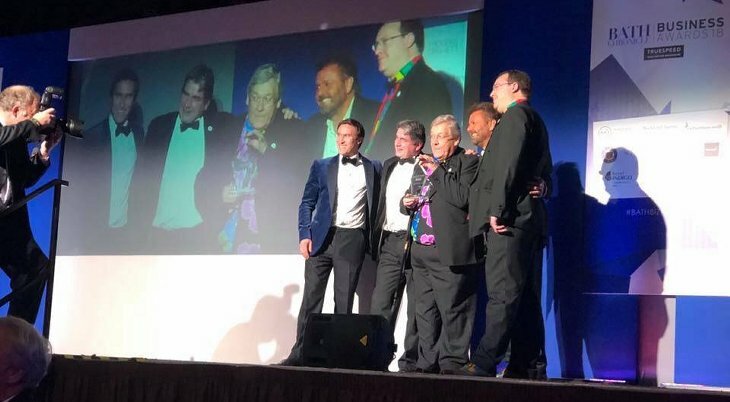 The awards are run by Bath Chronicle and the Leisure & Tourism award was presented by Tarquin McDonald, Chief Executive of Bath Rugby, who sponsored the award, at a ceremony held at the Pavilion hosted by TV star Martin Roberts. Our latest e-newsletter contains news of February shows, two of our biggest Festival shows and some exciting news from our friends at Bath Jazz... Click here to read it. 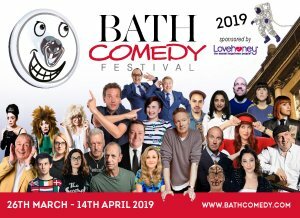 Bath Comedy Festival 2018 was our 10th birthday and in celebration we ran the Festival for 20 days, from Tuesday 27th March - Sunday 15th April 2018, and we're continuing to expand our reach and range of venues. We're delighted to have held the most successful Festival to date, from opening night at the stunning Bath Forum to the Closing Gala at the fabulous new Apex Hotel Conference Suite and the New Act Competition Final in the ever-improving Widcombe Social Club with its newly refurbished Waterside Arts Bar. We're creating some photo galleries which will be linked here soon, there's more info being uploaded here continually, and a brand new web site coming soon! 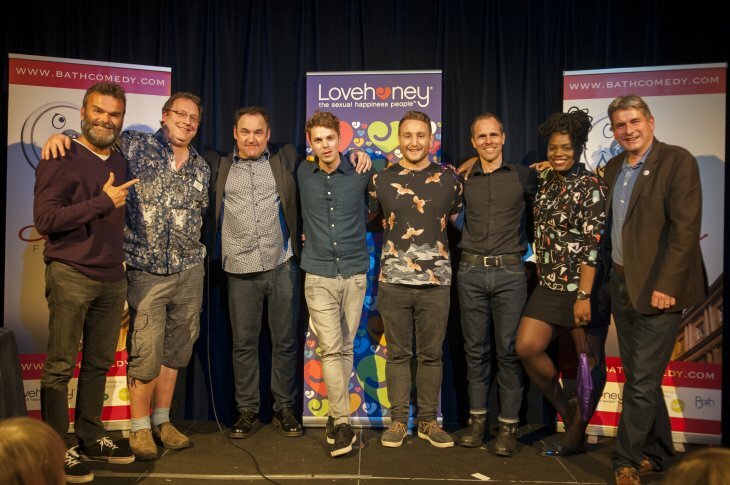 Pete Latham receives the inaugural Lovehoney Newcomer Award, a cheque from Bath Comedy Festival for £250, plus a guaranteed paid appearance at next year's Gala show. A separate presentation of the trophy was made at a special gathering of Festival supporters, patrons and friends, held at The Royal Ocean Racing Club in London. 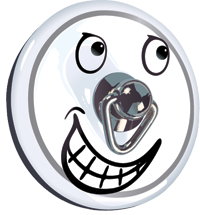 This year, Bath Comedy Festival has devised two new awards in collaboration with principal festival sponsor Lovehoney. 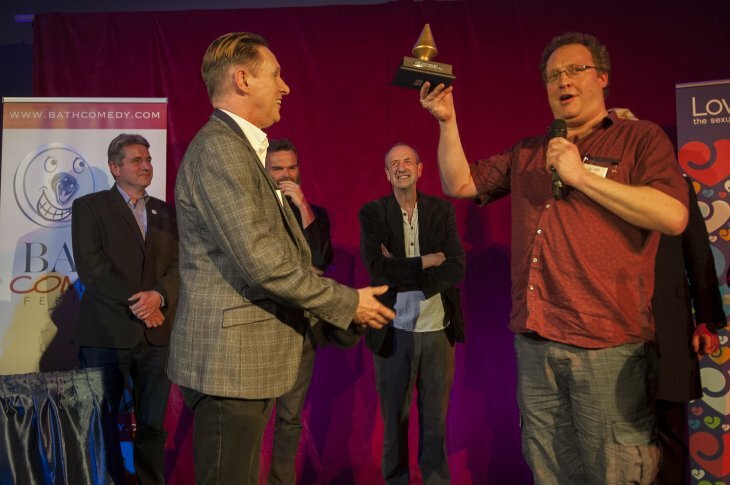 The inaugural Lovehoney Best Joke Award was presented at the end of the Festival's Closing Gala Show at the Apex Hotel, to Kev Sutherland, the creator of The Scottish Falsetto Sock Puppet Theatre, for the best innuendo-laden joke of the Festival. 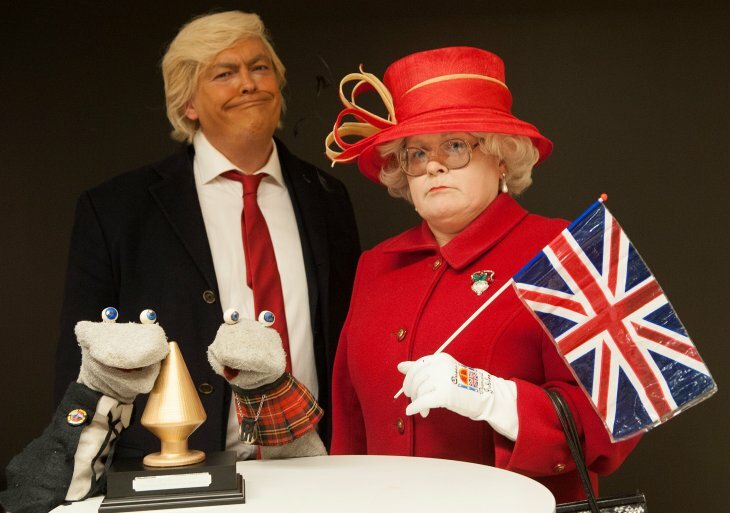 L-R The Scottish Falsetto Sock Puppet Theatre, President Trump a/k/a/ Lewis MacLeod, HM The Queen a.k.a. Ginny Adams of Rare Species. You can see the Socks tell the joke via Twitter - click here for them telling the joke in their show, and click here for a backstage version. We've archived the 2018 site now, but you can still see what happened by clicking here.